With age, our youthful charm and loveliness withers away, replacing it with frown lines, wrinkles, and folds. In this age of glamour and beauty, what most Australian women or men in their late 30s or 40s seek is to be rid of these creases of age as these lines tend to shatter their confidence and self-esteem. In fact, a review has divulged that one-third of Australian women believe facial allure and the reflected age matters a lot in case of promotions as well as future job prospects. There are many alternative anti-aging treatments both surgical and non-surgical, to halt the clock of aging for a certain amount of time. But their effectiveness and longevity vary from person to person. 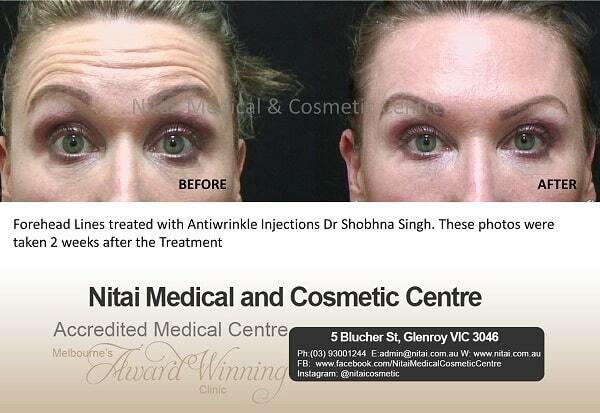 Amongst all those anti-aging treatments, at Nitai Medical and Cosmetic Centre, Melbourne, we have picked out one premium quality anti-wrinkle injection that has revealed the most impressive results on our patients. Let us understand in detail why this anti-aging treatment is termed as an advanced and premium quality solution. 1. What is this premium Quality anti-wrinkle injection? At Nitai Clinic, the anti-aging injection that is applied to our clients is a kind of naturally available purified protein which helps in relaxing the wrinkle generating muscles. This essential ingredient is synthesized from microscopic bacteria in neutral lab conditions. Type of anti-aging treatment is a prescription only method, hence, available at only professional medical and cosmetic centres in Melbourne. 2. When are these anti-wrinkle injections prescribed? With age, our face develops static and dynamic lines, which are nothing but the expression lines that occur in the upper and lower section of the face when we frown or smile or provide any such expressions contracting our facial muscles. Increase in age results in loss of collagen from our skin, which reduces the skin’s elasticity. Hence, the lines formed by the contraction of our facial muscles take time to relax and return to its normal position, thus, causing wrinkles and folds. To restore the youth and beauty, this is the most efficient anti-wrinkle injection that treats glabellar frown lines, crow’s feet and forehead lines among the notable few. 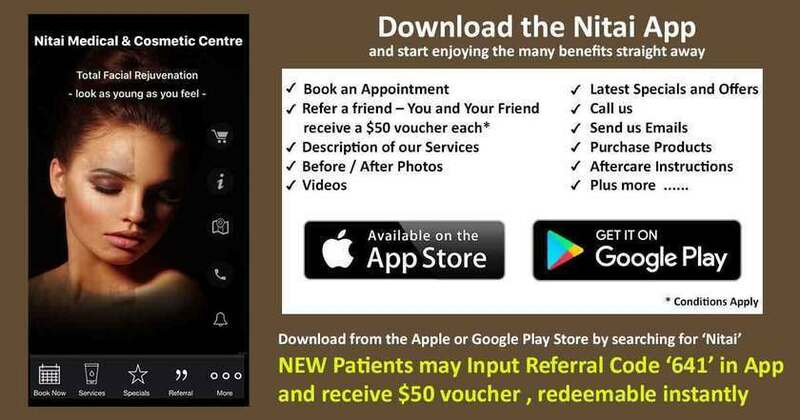 In the premium quality anti-aging treatment available at Nitai Medical and Cosmetic Centre in Melbourne, the facial muscles which cause wrinkles or lines are relaxed, eliminating the main reason behind the occurrence of wrinkles. In this type of anti-wrinkle treatment, the specific facial muscles are targeted with a thin syringe, hence, it is mandatory to seek a very skilled physician as even a small lapse in the judgement might end up in relaxing a wrong muscle or potentially other serious issues. 4. What are the steps involved in this premium quality anti-wrinkle injection? It is a very simple and fast procedure that can be completed within a couple of minutes. In this method, at first, which lines and wrinkles are caused by which muscle contraction is minutely traced, based on which target areas are selected. In the next step, a small amount of the wrinkle lifting serum is injected into the specific muscles to prevent those facial muscles from unnecessary contraction. Thus, the cause of wrinkles and fine lines are fixed easily without any pain or anaesthesia. 5. When are the results clearly visible? After undergoing this non-surgical anti-aging treatment, the results are visible instantly within the next 1-2 days. But, in order to witness the full course of its effects, a wait of 10-14 days is required. 6. How long does the result last? As per our observation, this anti-wrinkle treatment lasts for around four months, but it might last longer if treatment is continued in regular sessions. 7. What is the trick to ensure the longevity of this non-surgical anti-aging treatment? For impressive effects that last longer, the best approach is to continue the treatment at regular intervals without fail. This will allow the sustenance of product for the extended period and controls the occurrence of static wrinkles also much more effectively. 8. How is this treatment to fight wrinkles different than dermal fillers? Dermal fillers are synthetically produced gel-based substance that is injected beneath the skin to substitute for the loss of volume or enhance the volume in cheeks or lips and thus mitigates the appearance of wrinkles as well. But, this innovative anti-wrinkle injection primarily focusses on the elimination of lines, folds and wrinkles. It pacifies the facial muscles responsible for wrinkles, thus, eradicating the cause of wrinkles completely. 9. Is it possible to fuse this treatment with any other anti-wrinkle treatment? To boost the youth and beauty, this advanced anti-wrinkle injection can be amalgamated with other cosmetic treatments such as dermal fillers, hyaluronic fillers, etc. to magnify the overall charm of the face. This effective anti-wrinkle treatment will erase the existing wrinkles whereas the fillers will help to improve the hollow regions under eyes or cheeks or around lips to rejuvenate the youthful appeal of the face. In order to combine other cosmetic treatments along with this process, it is imperative to consult with one of the experienced and skilled cosmetic doctors in Melbourne prior to treatment. • Headaches, nausea and flu-like symptoms might also appear. Such an advanced sort of anti-ageing treatment should be conducted under the strict supervision of an efficient cosmetic physician in Melbourne, as it is a prescribed treatment which can be performed by a licensed practitioner only. 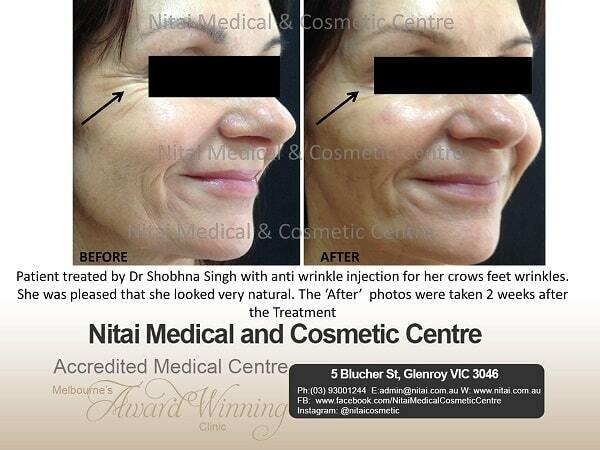 So, if you are planning to get rid of your wrinkles, visit us at Nitai Medical and Cosmetic Centre in Melbourne, because we genuinely care!